Let's start with my old friend that is back in my life! Iced tea!!! The illustrator and I used to go through 3 quarts of super sweet Southern style tea every night! This was in our college days. Ugh, looking back, I have no idea how we did this! I have not had iced tea of any kind in years. I think I just got so tired of it. Not to mention that my tastes have totally changed and I can't handle super sweet stuff anymore. Well, I don't think I mentioned this, but our upstairs air conditioner is broken and we are patiently waiting for the part to repair it. This would not be a huge deal, but most of our life is upstairs (work/sleep). It is not horrible at night since we have moved all of our beds downstairs (we have to airconditioners...just more to break), but in the heat of the day...it can get kinda rough. I drink a lot of water everyday. Seriously, I drink about 18 cups of water everyday. Since I have been drinking more due to the heat, I have wanted something with flavor. The illustrator recommended we make tea and add a little stevia to sweeten it a little instead of drinking humming bird food. I told him we could give it a try, but I was nervous that I would not even like the flavor of the tea any more. Well, it hit the spot! I dropped a few drops of NuNaturals Vanilla Stevia in my glass and it was so good. I have really enjoyed out tea ritual in the afternoons! 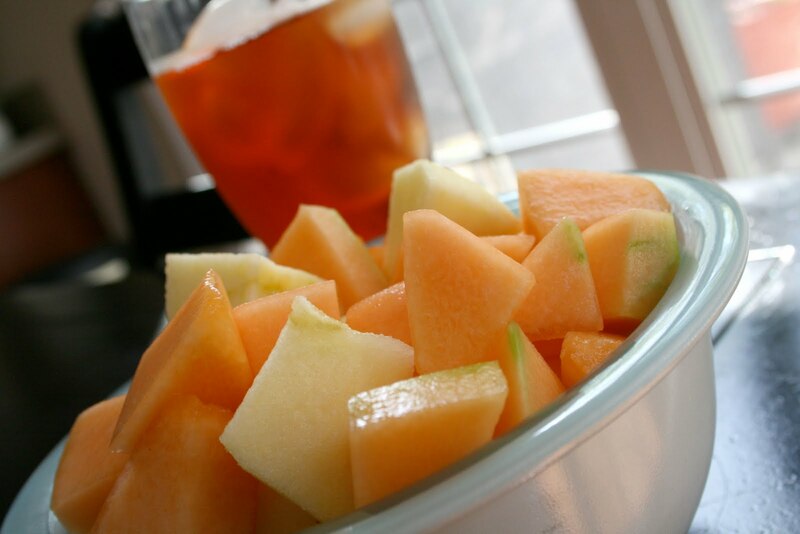 I love tea with fruit. So snack time has been a bonus of refreshing goodness! Dinner tonight was a big hit for me too! We had a few more odds and ends hanging around and I wanted to put them all together. So, I decided to do my version of potato salad! I DO NOT do mayonnaise! I can not even stand the smell of it. So, this one has my favorite creamy spread...hummus! I mixed together 1 (warm) baked potato, oven roasted asparagus, (warm) chickpeas, hummus and a few sprinkles of turmeric! All of this with a little Kosher salt and freshly ground black pepper on a bed of crispy romaine...I could have bathed in this bowl! I was so sad it was over! Perfect combination of creamy, crispy, warm and cool! Loved it!!! Ok, this is a weird question...when you eat something that is really good, are you sad the dish is over? I guess that is what having a passion for food and flavors is all about, but lately, since I have really been exploring new flavor combinations...I have really been loving my food! Yum, potato salad with hummus? I like the sounds of that! yes! especially when dessert is over. i'm glad i'm not the only one. Now I'm craving iced tea even though it's nowhere near hot yet. And I love your salad idea too. Sounds perfect. I too miss my meals and feel bad that the last bite will soon be gone. Sigh. Yes, I often mourn the end of yummy food. lol Your potato salad looks delish! 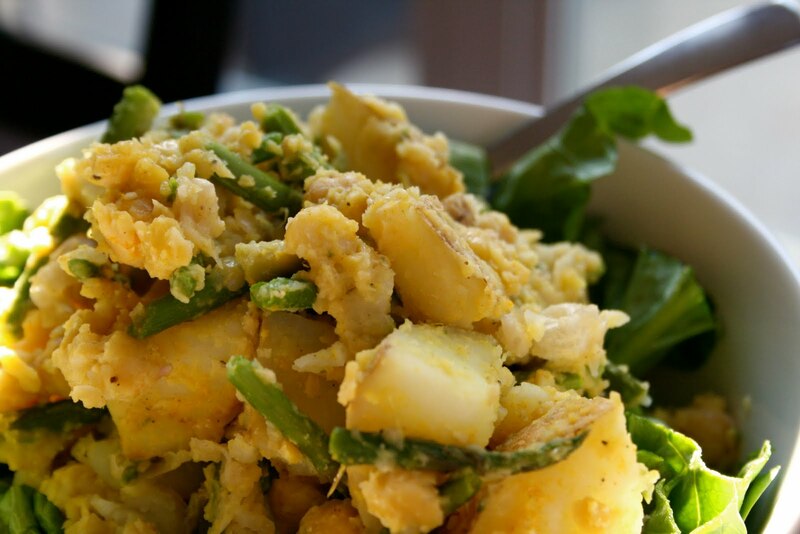 I love the idea of hummus as the dressing in potato salad! I really don't like mayo either...I mean it's fine mixed into stuff or if it's spread very thin on a piece of bread. But anything more and it's sort of :? 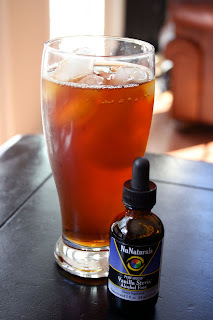 I love iced coffee more than tea but either work...and i LOVE my nu nat vanilla drops...omg they are the BEST! I don't like iced or hot tea...not sure why. Just not a tea gal! But now coffee...oh a completely different story! haha! I drink unsweet tea all of the time. Prefer it to everything else I drink...except well beer of course! That potato salad looks wonderful! BTW, Starbucks has milk, gluten, and nut free sugar cookies in a little bag that are really good. I ordered them for Lucy today because they were out of the regular kind. They were really good and guess what they're called? Lucy's cookies. HA! Using hummus instead of mayo is such a great idea!! Oh my gosh, I went to college in South Carolina, and I TOTALLY overdid it on the sweet tea. I burned myself out on it, like you-- and good thing! lol. That looks awesome! I'm going to try this!! haha i do get sad when my meal is over sometimes!! always usualyl with my oatmeal! I always want more after just one serving, but when I have it once a day it makes it A-OK! I HATE MAYO! Hummus is my fave too! I want to try it!!!! !